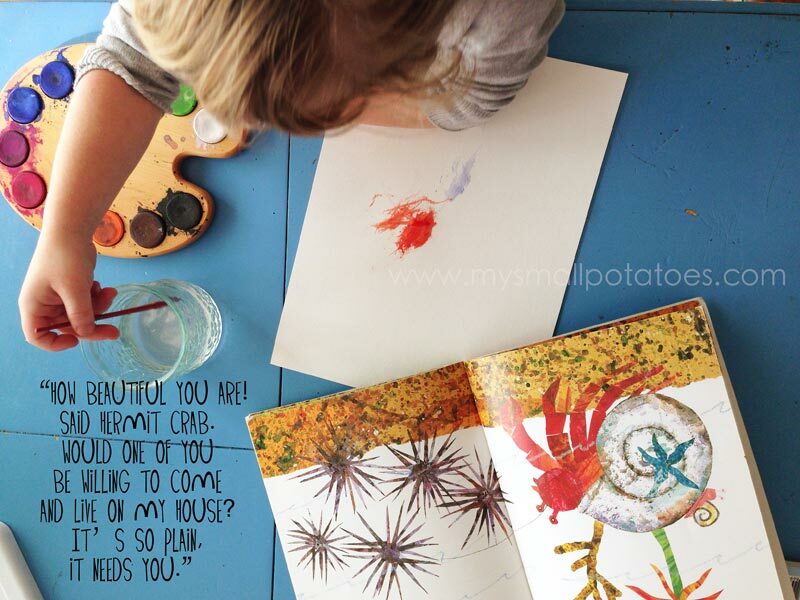 Books are far more than just a cute story for kids. You can explore them. Stretch them. Learn from them. 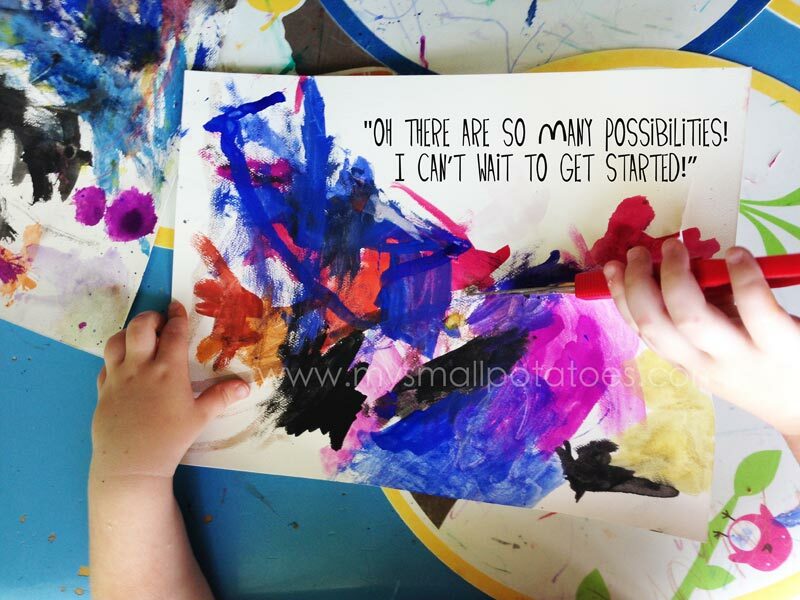 There is so much possibility in books. 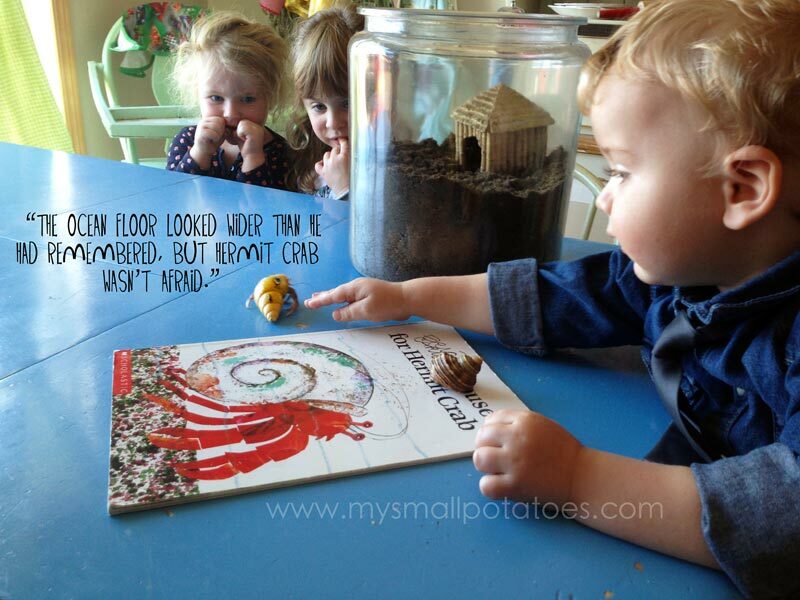 At Small Potatoes, we like to bring science, literature and art together to form one great big afternoon of learning. 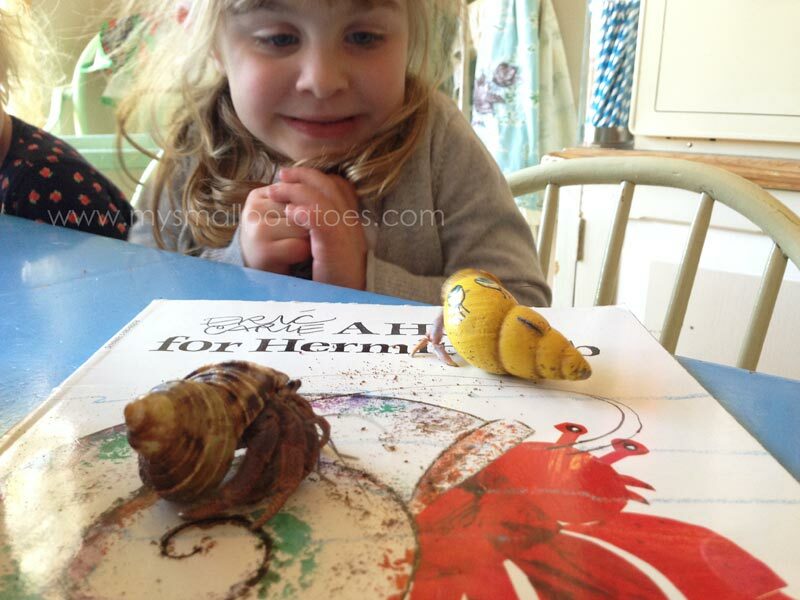 Today we are diving into A House For Hermit Crab. 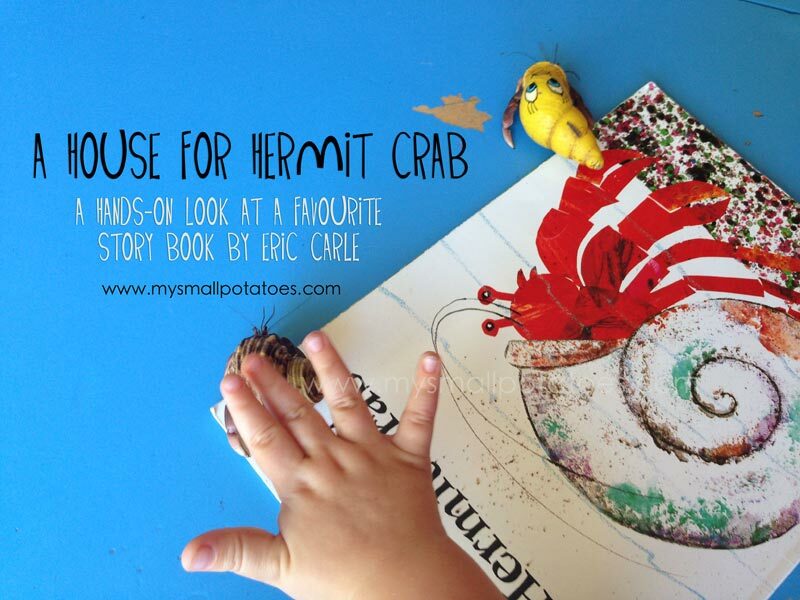 If you have never read this book, it is a story of a hermit crab looking to decorate his shell, which he describes as, well, a little plain. 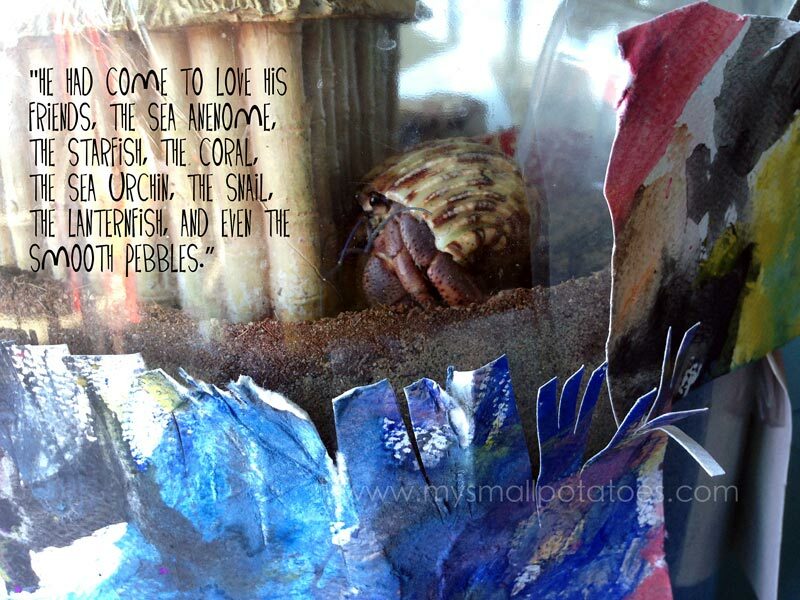 He travels the ocean asking all the beautiful creatures of the sea to come and live on his shell. This book has sat on our shelf since the beginning of Small Potatoes. It has been read and reread, and the pages flipped and poured over countless times. 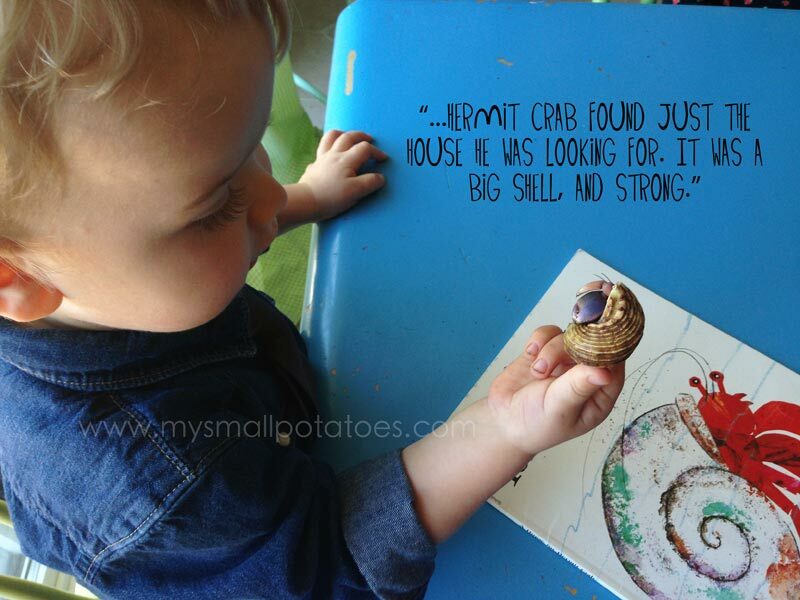 It was time to take this Eric Carle classic a little further. 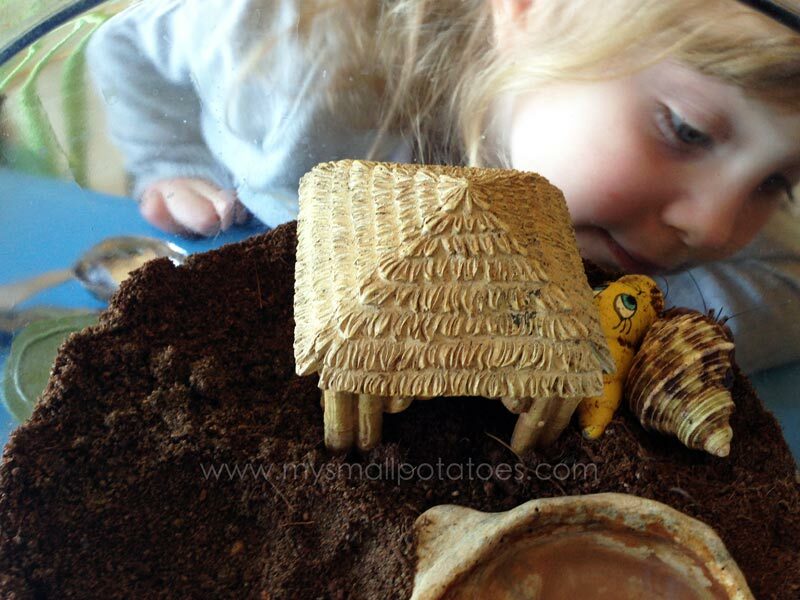 Cue Sven and Gypsy Danger…our new Hermit Crabs. I really really like this! 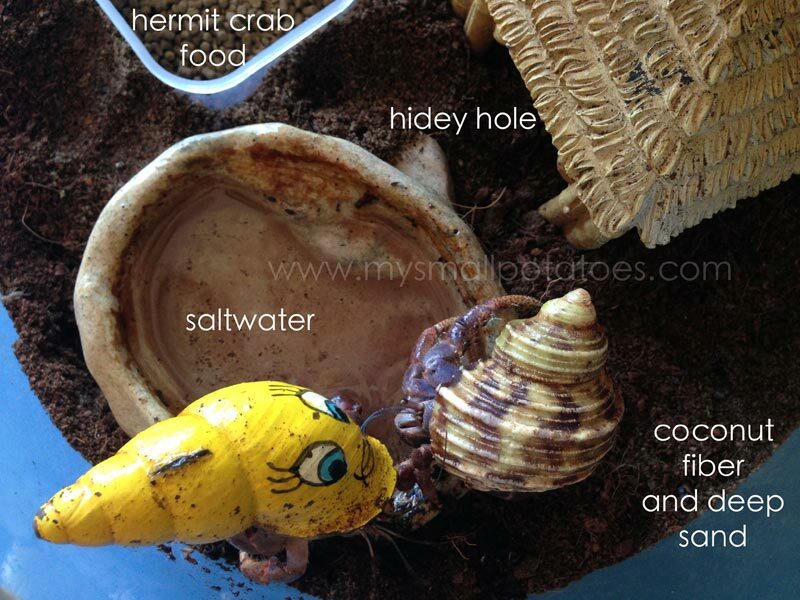 I am a teacher and would love to have hermit crabs in my class someday. So neat! THIS is a really cool idea! I just may have to duplicate! This is such a great idea for an unforgettable afternoon! 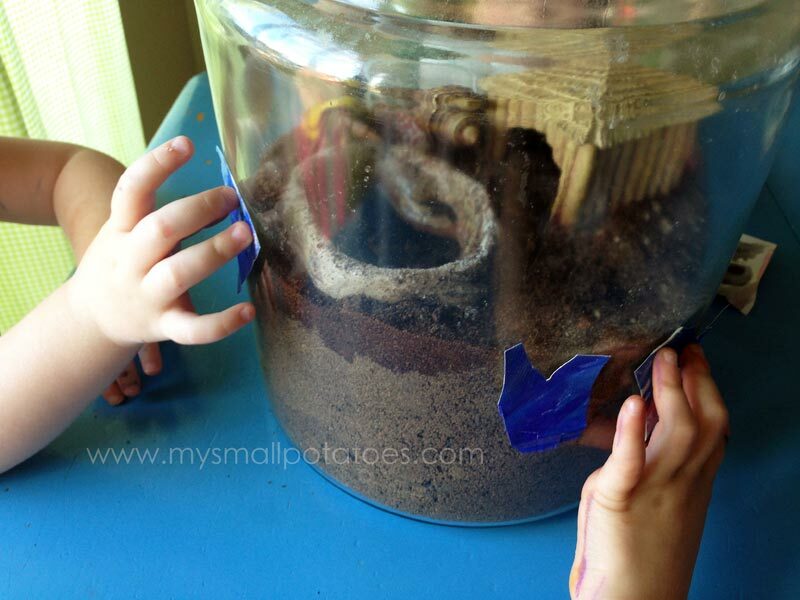 My son and I did something similar with ladybugs, but I didn’t think about making some decorations. Thanks so much for the idea and the recommendation! What a great idea. I loved the pictures there faces showed their interest or varying degrees of hesitation. i love this, such a cute idea!! 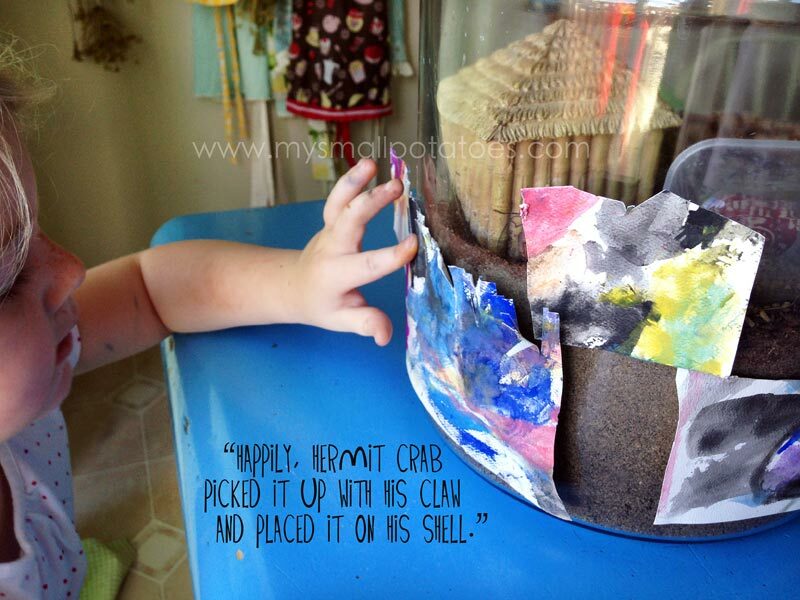 My sons preschool has hermit crabs. They are adorable and so easy. We are considering adopting a couple this summer. How has it been going so far for Sven and Gypsy Danger? Peanut butter?! Ha I never would have guessed! How long do they live? I didn’t really know…but ours are a few years old now. I love your ideas! 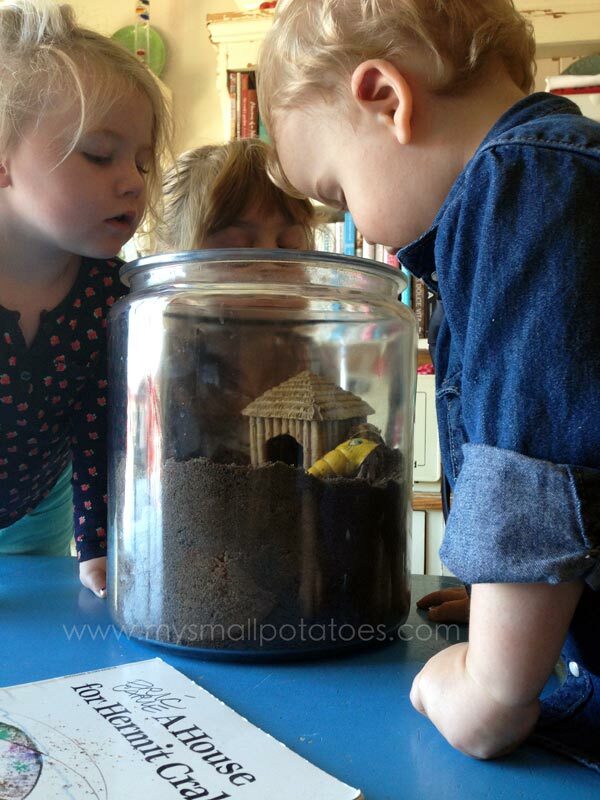 The kids are so engaged with what you are teaching them…they are having fun!! I love how you bring the stories to life!!! Cannot wait to pick a book out and get hands on with the kids! This is awesome! 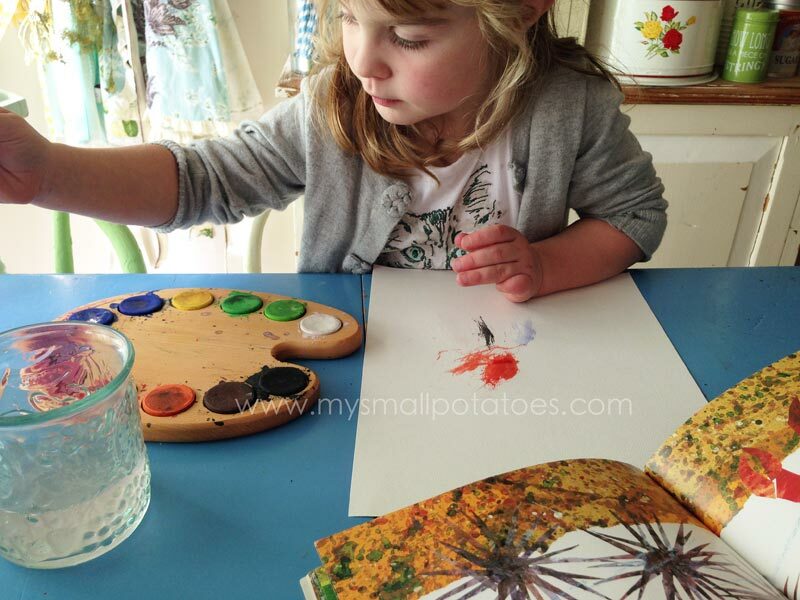 What great ideas on how to bring out the story in new ways and incorporate art. Reading your blog inspires me a lot. I am giving birth to a baby girl in a few weeks and I am happy to have stumbled upon your blog. Thank you and keep inspiring! I just recently read this book for the first time. How fun to find out about everything you did with it! Thanks for sharing. 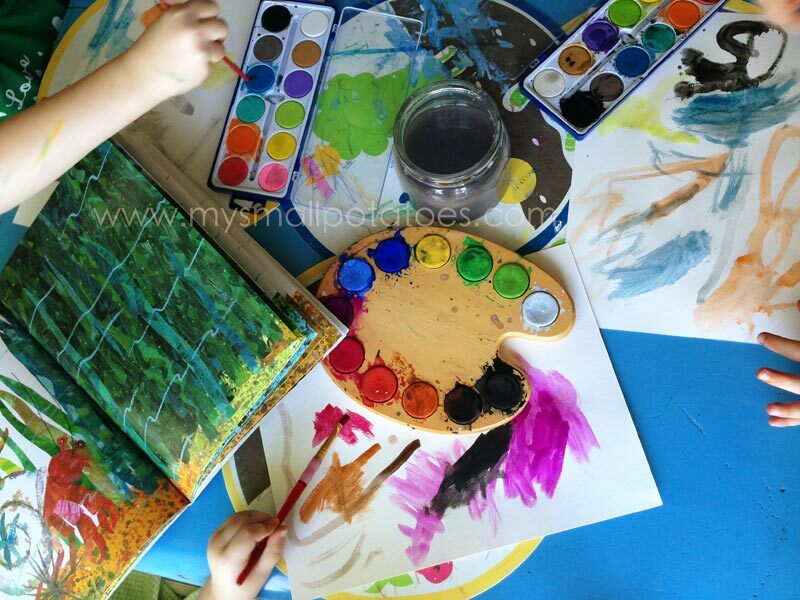 I love the block tempera in the wooden palette. It is so inviting! Would you share your source please? I found it at a thrift store…barely used!! Lucky!